I’ve said it before and I’ll say it again, one of my favorite parts of running this website is the excuse to check out sweet knives. I can try to do this under the pretense that I am offering the reader some noble service, and perhaps even some entertainment, but lets not kid ourselves here – it’s all about the blades! So when I got the chance to pick up a Combative Edge SALUS I didn’t waste any time. Limited to only 50 pieces, this thing epitomizes cool yet maintains a level of practicality that makes it work just as good as it looks. Regular readers will notice that this is a little outside the more “mainstream” knives I review. In fact, I’m sure quite a few people will be entirely unfamiliar with Combative Edge, as they are a relatively new boutique brand. Guys, I love to review these more exotic knives but it all comes down to money, time and availability… but with any luck this won’t be my last Combative Edge review. I also want to mention that this knife was made for Combative Edge by Fox Knives of Maniago, Italy. I do not have a lot of experience with Fox Knives (or Italian knives in general) but due to the rising popularity of Italian blades I hope to remedy this quickly. I will say that my initial impressions of Italy’s cutlery capabilities are extremely favorable. This knife in particular is beautifully made and I will get more specific as we work through the review. The SALUS has a 5-7/8″ blade, an overall length of 10-7/8″ and a weight of 10.5 ounces. Considering that this is a full tang knife made from 5mm stock I think this is a lightweight and carry-able knife (that is, if you can carry a foot long fixed blade in the first place). The almost 6″ blade gives you plenty of cutting space and a good amount of reach, while the handle allows for a comfortable grip in a variety of positions. This is a very practical knife that can be used in tactical and survival applications. The SALUS is made from a large piece of Bohler N690Co stainless steel. Admittedly, I do not have much experience with this steel. However, Sal Glesser, owner of Spyderco Knives, refers to N690Co as a “European VG-10”. Additional research has found that this steel has a tight grain structure and is capable of taking a very fine edge. Also, this steel is supposed to be highly resistant to corrosion. My understanding is that this N690Co takes some work to sharpen (much like VG-10) but is overall a very good steel. The N690Co on the SALUS has been given a black Diamond Like Carbon (DLC) coating. For those unfamiliar with DLC coatings, this is the bonding of a carbon material that displays some of the properties of diamonds to the bladesteel. Unlike more typical decorative coatings, DLC coatings can actually increase resistance to wear and have many industrial applications. Naturally, depending on the manufacturer the formulation of the coating and other variables, you will experience different results with a DLC coating on the blade of a knife. While I have not hard used this knife I have noticed that the coating is very durable. I’m sure if you were to really gouge the steel it would leave a mark, but DLC is generally one of the toughest coatings out there and Fox did a great job with the SALUS. The blade itself is a large American tanto shape with a drop point and swedge on the front half. The American tanto blade shape offers awesome penetration power. The 5mm thick blade tapers down at the very tip, but by and large this is a very stout blade. A flat grind has been applied about half way up the knife. I have no doubt that in a the SALUS could baton and perform other bushcraft/wilderness survival tasks. The SALUS features a highly textured G10 handle. These are 3-D machined handle scales and they feel awesome. It’s obvious that a lot of time has been spent getting the palm swell perfect and all of the lines are flush and wonderfully finished. The texture that was milled on is aggressive yet comfortable, which ensures a firm grip as the handle seems to melt into your hand. In addition to the awesome scales, ergonomic features abound on the handle. There are two finger choils and two thumb ramps providing a ton of options for the user. You can choke up or pull back on the knife, in forward, reverse and every grip in between. I’ll tell you it’s really hard to write about this (so hopefully the video can fill in a little) but the way this has been executed is near perfect. The jimping is sharp and meaningful and the choils are well spaced. Everything works, and there are no compromises. It’s obvious a ton of time went into designing this handle. It’s an outstanding part of the knife that separates it from the pack. Rounding out the handle is a large exposed pommel (for a “non lethal” option – I would NOT want to get cracked with this thing) and a couple lanyard holes. If the excellent steel, superb design and marvelously finished handle weren’t enough to distinguish the SALUS, take a look at the sheath. In some ways the sheath impressed me the most because it shows how far the guys at Combative Edge went to ensure this is a 100% high quality product. The sheath itself is made of kydex and is mated to a removable cordura carry system with a series of 4 velcro straps. The kydex sheath is snug, with a very secure fit and a small drain hole at the bottom. If you want to run just the kydex sheath there are plenty of slots and holes for webbing and paracord. However, I think the cordura part of the sheath is a nice option and has been reinforced with plastic and extra stitching. The blade is further secured with a double snap strap that falls out of the way when open so you don’t inadvertently cut into your strap when drawing the blade. The sheath is Molle capable and includes two genuine Blade-Tech Molle locks with all the hardware. Combative Edge also included two adjustable straps for use in a thigh rig. And just like everything else, this isn’t some cheap strapping. This is high quality nylon and one side has been given a rubberized no slip coating. A small amount of elastic ensures a secure and comfortable fit. Details like this really impress me and show the level of thought that went into even the more minor details. At first glance, the sheath does not appear to be lefty friendly, but if you mess with the velcro straps you can carry this for left handed draw – admittedly it’s not as elegant as the right hand setup, but it does work. All in all I am very pleased with the SALUS. The design, the materials and the fit and finish are all top notch. Rob Walker and the crew at Combative Edge really thought this one out and executed a brilliant take on the modern combat knife. The SALUS is typically made and sold in small quantities. As of 2013 CE is no longer offering the SALUS with a tanto blade shape. Instead, they have decided to offer the knife with a drop point blade instead. Limited quantities give the brand an even tighter “botique” feel and in my mind, further distinguishes Combative Edge from other offerings. I recommend purchasing the SALUS at Amazon or BladeHQ. Purchasing anything through any of the links on this site helps support BladeReviews, and keeps this review train running. As always, any and all support is greatly appreciated! Great review Dan. You do provide a valuable service so feel free to keep spending your money on knives just so you can tell us about them! I always appreciate when a knife comes with a well thought out and multifunctional sheath like this. I’m a big fan of VG-10 so I guess that I will have to try N690Co someday. Haha, thanks Matt. These reviews are always a great excuse to check out some new stuff. 😉 N690Co seems pretty solid – definitely needs more testing before I can really say much about it. Thanks for stopping by man, always appreciated. Nice review and video. Great to see a well designed sheath which is where some otherwise nice fixed blades fall short. I wish it was not a limited run, I would love to buy one to use (read, play in the backyard) but could not stand the thought of scratching up such a nice knife I could not replace. Keep it up, always look forward to a new review here!! Thanks man. You know I think if they sell more Rob would make more. It’s a small company so I think they can only commission so many pieces. That said, I’m very hesitant to hard use such a beautiful (and limited) piece as well so I totally see where you are coming from. Thanks again for the kind words, glad you are enjoying the reviews. I’m not much for these tanto styles. 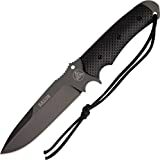 The ergos look great, and the sheath options look excellent, but I think a more basic curve instead of the 2nd point would make this a more useful blade for a military man. Keep reviewing ’em Dan. I like seeing usual and unknown brands get some attention. Thanks RK. I like reviewing unusual and less known brands so hopefully we will get some more variety on here! I’m waiting on one of these bad boys too. I just received the M1 serrated. Awesome knives and Rob Walker is a good guy running a tight ship. Thanks for the review Dan! Awesome man! Your SR11 review is what got me interested in Combative Edge in the first place. Lookin forward to your take on the SALUS and M1.